COLUMBIA, Mo. – On the first day of classes, the University of Missouri welcomed its largest student body in its 175-year history with 34,935 students enrolled and a record number of 27,411 undergraduate students enrolled. Mizzou’s incoming freshman class of 6,546 is nearly the largest in MU’s history, second only to the 2012 freshman class of 6,560. The incoming freshman class is also Mizzou’s highest-ability entering class in history with an ACT mean score of 25.9, as compared to an average score of 25.7 for the incoming freshmen classes the past three years. Additionally, 560 Bright Flight recipients, 288 Curator Scholars and 379 Chancellor’s Scholars are members of MU’s freshman class this year. Last fall, Korschgen and Chancellor Emeritus Brady Deaton announced scholarship improvements to high-ability students in an effort to address the increasing cost of higher education in the nation and to maintain and continue the highest quality education for which the University of Missouri has become known. The total number of minority students rose this year to 5,386 compared to 5,116 last year, an increase of 5.3 percent. International student enrollment is 2,323, also the highest in Mizzou’s history, which reflects an increase of 10 percent compared to last year. 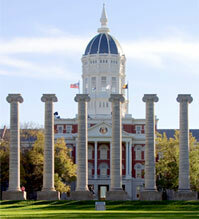 Additionally, this year marks the highest retention rate in MU’s history of 86 percent. MU students also are enrolled in a record number of online classes, with students registered in nearly 24,000 credit hours of 100-percent online coursework.